Should you come across a body of water in the Brussels area with a blueish tint, don’t stick your feet in it, no matter how hot it gets. This advice comes courtesy of Bruxelles Environnement, which has discovered cyanobacteria in several ponds in the capital and in parts of the canal. Cyanobacteria blooms have a green or blue sheen and are toxic. Danger to humans largely involves the bacteria being ingested, but it’s a good idea to avoid all contact, said the agency. The bacteria, also called blue-green algae, is appearing on the surface of still bodies of water now because of the abundance of daylight and the ongoing warm temperatures. The bacteria can cause headaches, nausea, nose and throat irritation and diarrhoea. 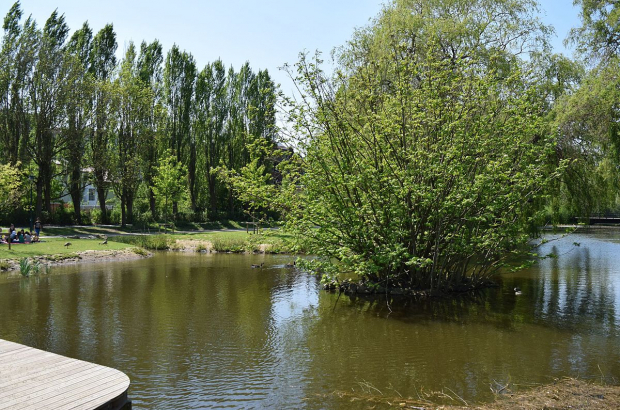 Cyanobacteria has been found in the ponds at King Baudouin Park in Jette and at Rouge-Cloître in Auderghem. As children and animals are the most vulnerable to illness from the bacteria, visitors to those parks are asked to keep them away from the ponds. The bacteria has also been seen in the canal in the area of Brussels Beach and the Molenbeek Lock. The agency is advising residents to not fish in the canal for the moment. A Bruxelles Environnement spokesperson told Bruzz that when temperatures drop just a bit and the capital sees more wind, which stirs up the surface of waters, the situation will improve.